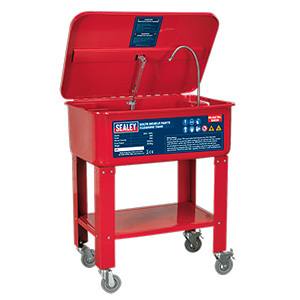 This heavy duty, 50 litre parts cleaning tank is a one piece construction that sits on stand with 100mm diameter castors, meaning it can be easily re-positioned in the workshop. The fully sealed electric motor with magnetic drive pump circulates the cleaning solvent through the flexible metal nozzle and directly where required. This tank includes a removable shelf for storage and basket to keep your small parts together during the cleaning progress. As an extra safety feature, the lid has a self-latching fusible link, automatically snapping the lid shut in the event of a fire inside the tank, extinguishing the flames.